Are you struggling with back acne? Thinking of giving up on fighting acne? Close-Up Shot: The zits even grew up to the back of her neck. Close-Up Shot: And you can tell, they were all red and inflamed. 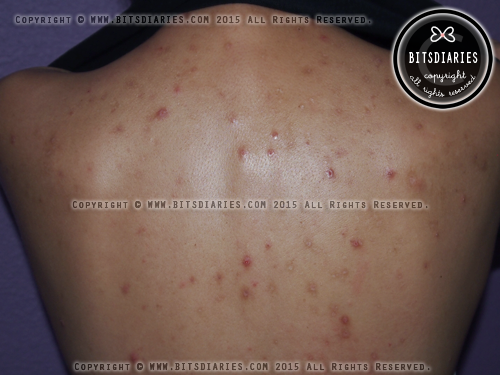 She had tried various methods to treat her back acne but to no success. Instead, it became worse. Being a lady who likes to wear semi-revealing outfits (but nothing promiscuous), she was dejected as she had to avoid wearing backless, low-back outfit, let alone bikini/swimsuit, because she was well aware that flaunting a pimple-ridden back in such outfit in public can be very embarrassing and hideous, and people may even start to talk about her. It really affected her self-esteem for sure. So ten and a half months ago, she approached me for help in that state. To tell the truth, initially, I didn't want to help her because I am not a skin care expert. There is a possibility that I might make her acne worse instead of healing it. But she said that she will not put the blame on me if her acne got worse because it was her idea and she was the one who approached me. Since she said that, I agreed to help however, I made no promises on the results. I even told her to be prepared for negative results. From then on, she became my experiment subject. LOL. It was quite difficult to find the ideal body care products for her skin because she has really sensitive body skin, but we did not give up. It took some trial and error finding the suitable products and at the end of the long journey, our patience was rewarded — the results turned out positively. Well, you can tell that there are still plenty of imperfections — scarrings resulted from popping and scratching the zits (her bad habit), which are out of my capability. [...] On the bright side, the overall appearance of her back has definitely improved. In conclusion, it is POSSIBLE to clear up back acne as long as you treat it in the correct way. Therefore, if you have back acne, DO NOT GIVE UP FIGHTING! Side information: My friend is very happy and willing to share her story, so she granted me the permission to share her story and pictures publicly on my blog. She hopes her experience and success story would be able to give you, whoever is in the same boat, a glimpse of hope and motivation to continue battling! So keep fighting! 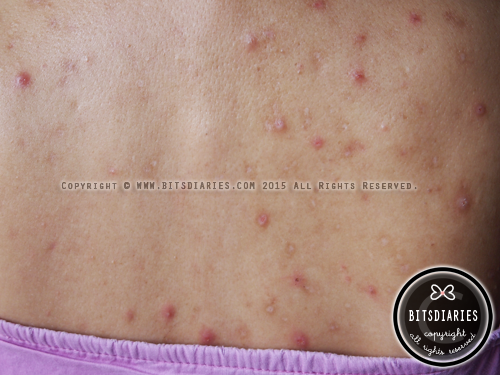 (Update on 11th August 2015): If you would like to find out what products she used and the tips, check out PART 2 — "Dealing With Back Acne: The DOs and DON'T"!